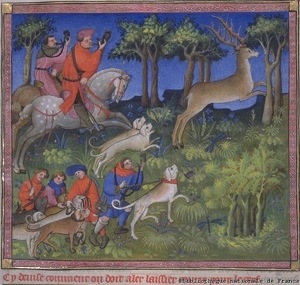 One of the most famous illustrated books of the Middle Ages, the Livre de Chasse (or “Master of Game”) by Gaston Phoebus, brings the medieval sport of hunting to life in colorful detail. (Illustrations from the book are included throughout this article courtesy of the National Library of France.) Knights, princes and noble ladies loved to go hunting – but villagers, farmers, abbots and even nuns took part in the sport as well. Livre de Chasse shows not just the practical value of hunting (good exercise and putting food on the table), but also the social and cultural importance of the sport as well. In the illustrations, hunters and game animals alike are depicted with an unmistakable spirit of dignity and nobility, and hawks and hounds, like good knights, are imbued with a sense of loyalty and self-sacrifice. 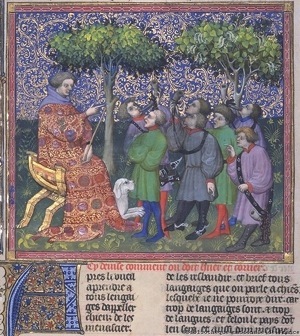 But perhaps the most evocative of these illustrations are those in which the “master hunter” himself instructs a band of young hunters on the techniques, rituals and etiquette of the hunt (pictured at right). Clearly, the hunt was a learning opportunity for principles like responsibility and self-control. Hunting was a rite of passage, and it might be the first place a young knight could learn (and demonstrate) the ideals of the code of chivalry. In today’s world, we sometimes forget that a rite of passage serves as an important aspect in the establishment of a moral code. Without moments to pause and reflect on what we’ve learned, where we’ve been and where we want to go, our values and principles can get “lost in the shuffle.” As this article, written by an avid hunter, reminds us, it’s not the activity that’s important. Rites of passage can be found in hunting, team sports or martial arts; in sending a child off to school, cooking a family meal or getting behind the wheel of the family car. Whatever the occasion, parents should use every opportunity to instill the values of honor, responsibility and chivalry in their children — and take every opportunity to look back and recall the lessons they learned at those “turning points” in the cycle of life. Another year is rapidly coming to a close, and with autumn comes the opening of deer season. Hunting is one of the things all of us guys look forward to, and we usually start feeling the itch shortly after Major League Baseball’s All-Star Game! I brought my two sons to help with the camp and field preparations for this year’s hunt. It was hard work, but I wanted them to begin to learn the value of teamwork, pack-it-in/pack-it-out stewardship, and sweat equity — very important lessons for children to develop. As a father, I want my kids to know how important it is to appropriately manage the natural resources God provided for us. 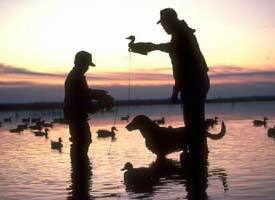 If they want to hunt, they need to put in the effort at the front and tail end of the season. After the day’s work, and the kids had bedded down for the night, something occurred to me: The modern youth have very few moments in their lives where they can definitively mark life transitions. What I mean is that kids these days will transition from toddler, to adolescence, to teens, to adulthood with little life mile marker or fanfare. As a young man in the warrior class, these boys would be singled out and sent to the castle as a page. A page was a servant of the king or other stately aristocrat who would train the young lad. The page would clean stables, repair barns, learn combat skills, and in general, serve the needs of the lord of the manor. Essentially this made great leaders as each knight learned what it meant to serve the needs of others before his own were met. After seven years as a page — around the age of 14 — he graduated to the position of squire. With the increase in position, so came the increase in responsibility. The squire moved from service to the lord, to service to a knight. For a squire to become a knight, he had to show loyalty and bravery in harsh, battle conditions. The squire was the shield bearer of the knight, which is to say, he was the knight’s personal aide. He carried the shield, the banner of the knights family, guarded the knight’s prisoners, and replaced the knight’s sword should it become lost or damaged in battle. At the age of 14, the squire was an aspiring knight and he discharged his duties to the best of his abilities. Finally the squire becomes a knight. He has faithfully served his master for nearly a decade and has proven his usefulness to society, the king, and the realm. Similar to the U.S. Marine’s mantra, “Unit, Corp., God, Country,” the knight fought for the ideals of his country and was self-sacrificing for his countrymen. Over 20 years, this young man has learned his responsibility to his people, his humility before ladies, and his duty to fight as protector of the intangibles of State. In each of these transitions, there was a ceremony (perhaps small) that would mark the boy’s promotion and responsibility change. This would culminate in the ceremony of knighthood. The knighting ceremony was a ritual not taken lightly by the squire; after all, he’d been waiting his entire life for such an occasion. It began with a ritual bath the night before the ceremony. He would then engage in an all-night prayer vigil — many times his armament would be laid on the alter — and receive the blessing of the church. His father (if a knight himself), the king, a noble, another knight, or clergy would confer knighthood by dubbing the squire’s shoulders with the flat of the sword. The newly dubbed knight would swear an oath, rise, and then publicly display his warrior prowess by performing different combat techniques. The oath of chivalry included the knight’s commitment to always defend a lady; always speak the truth; have devotion to the church; be charitable and brave. There is a modern equivalent of the knight that swears similar virtues — the Boy Scouts. So what does the modern parent do? Most of us don’t have stables to clean, damsels to save, and dragons to slay. How do we train our kids into the code of chivalry and provide markers in their development for them to see they are moving up as young men? A friend of mine planned a milestone for his son’s 12th birthday. Jon lives up in Kansas and his parents have some property that is moderately wooded. Out among the trees, in a quiet place, was a folding chair and father and son took a walk from the car to the chair. While son sat down, father began to explain the meaning of manhood. He spoke to his son about integrity; doing the right thing even when nobody was there to watch. He spent about 15 minutes with his son alone in the woods on the topic before walking back to the car. Waiting at the car was Jon’s dad, who then took a turn with his grandson at the chair in the woods. His conversation covered duties as a husband. He spoke of the Biblical mandate to keep charge over his future bride, to protect her physically and emotionally; to be a provider; to serve her needs before his own; and to lead with courage and commitment. About 20 minutes later, grandfather and grandson approach the car, where Jon’s father-in-law awaits his turn. Back to the chair they walk where grandfather speaks of a man’s responsibility to his children. To pass on leadership qualities; to care and provide for them; to discipline with equity and consistency; to instill in them a desire to succeed in all they do. Each of these men discussed humility on the one hand, and excellence on the other. Leadership means that you accept responsibility when you do things wrong, and share glory when it goes right. As the four gathered at the car, the three men prayed with the boy. As a present, they presented a .22 LR rifle to him. With the passage from childhood and closing in on manhood, the rifle, like the sword, was meant to show that his responsibilities had changed and with that came greater trust. As I bring this article full circle, my sons are learning to shoot, and developing a love of the outdoors. This dove season, with a .410 in hand, my son was able to shoot his first dove, and learn how to clean it. We will enjoy a dinner with the animals we harvested at the end of the season. He too has learned that he is gaining responsibilities and he must exercise great care with the things he is trusted with. In our day and age, hunting should be a rite of passage for a young lad. They learn a healthy respect for the deadly weapon they have shouldered for the task, and they learn respect for wildlife and proper game management. Stewardship. Hunting and the outdoors bring us closer to those knights before us who balanced ferocity and tenderness. A true man. The kind of characteristics our young boys should admire and model.